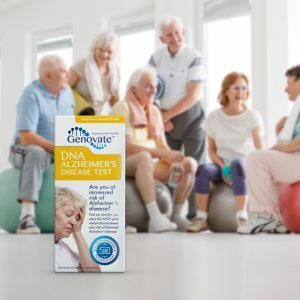 Did you know the APOE gene can affect your risk of cardiovascular disease? At your annual exam two months ago, your cholesterol levels were through the roof. Worried about your risk of a heart attack, your doctor prescribes a low-fat diet. You follow the diet religiously, but the results are not good. Now, it’s time for more drastic measures, and the doctor prescribes Lipitor. He can only hope that the treatment will be effective. You are left wishing there was a better way to predict the best treatment for you. Cardiovascular disease involves the narrowing or the blocking of blood vessels, leading to chest pain (angina), heart attacks and strokes. Heart attacks and strokes account for over one-quarter of deaths each year in North America. Known risk factors include high blood pressure, high cholesterol, smoking, poor diet, physical inactivity, excess weight, age, and genetics. When identified early, you can mitigate your risk with simple diet changes, increased physical activity, and medications to lower cholesterol levels. One gene strongly linked to your cardiovascular health is APOE. It encodes the apolipoprotein E protein, which controls the uptake of cholesterol and fats from the bloodstream into the cells. There are three common genetic versions (alleles) of APOE, called APOE e2, APOE e3 and APOE e4. We inherit one copy of APOE from each parent, which means that we each have two copies of this gene. It’s possible to inherit two copies of the same APOE version, or two different versions. Normal healthy blood cholesterol levels are associated with the most common e3 allele. The e2 allele is associated with lower LDL “bad” cholesterol that contributes to blocked arteries. But, this seemingly beneficial allele is not so beneficial if you inherit two copies of it. The e2/e2 genotype is linked to an increased risk of type III hyperlipoproteinamia, which is another factor that contributes to heart problems. The “heart attack” e4 allele strongly associates with elevated LDL-cholesterol levels. LDL-cholesterol is one of the biggest factors linked to an increased risk of coronary heart disease. 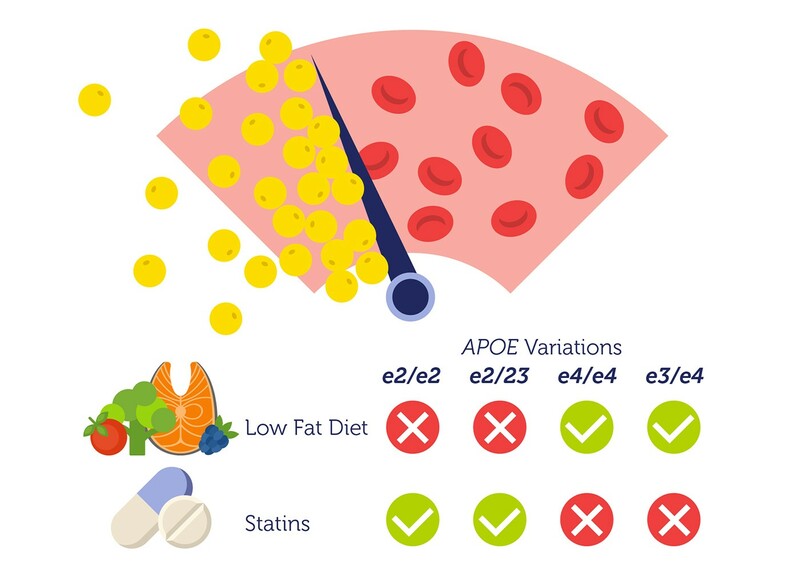 Variation in the APOE gene not only influences our cardiovascular health, but also how we respond to different treatment options. People with either two copies of e2, or one copy each of e2 and e3 generally don’t benefit from a low-fat diet. However, they respond well to statins (cholesterol-lowering medications). 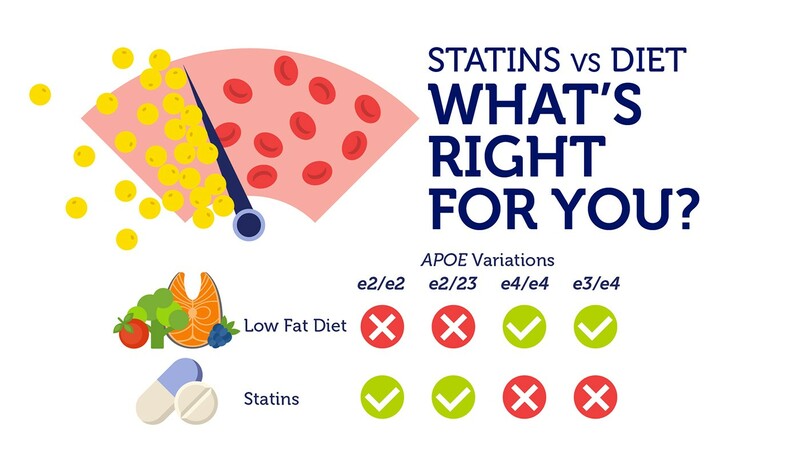 People with two copies of e4, or one copy each of e3 and e4, may not efficiently respond to statins, but will benefit more from a low-fat diet to lower their cholesterol levels. Thanks to advances in DNA technologies, you can now find out which alleles of APOE you have inherited. If you have high cholesterol, this information can help you and your doctor devise a treatment plan that is personalized to your genetics. Or else, simply knowing that you are at increased risk of heart disease might be enough to prompt you to make better lifestyle choices to minimize your risk. 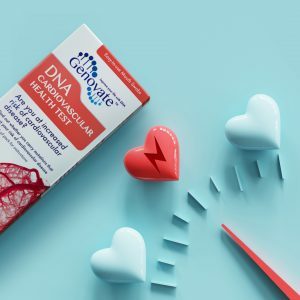 Take control of your cholesterol with the Cardiovascular Disease (ApoE) DNA Test, so you don’t become another heart attack statistic. 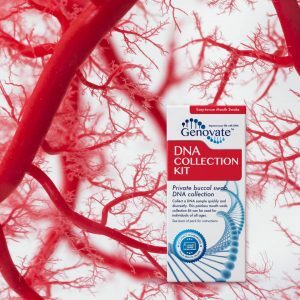 Previous articleDid you know DNA can cause thrombophilia? Next articleDid you know DNA affects your cardiovascular health?